My flight back to the beautiful city of Cleveland last night kept getting delayed because of the weather. I didn’t get home until 1:30 am so I am staying awake at work today with a sliver of hope and an IV drip of coffee. Needless to say I am glad to be home, despite us being LeBron James-less. Let’s get over that and move onto fashion. This polka dot shirt was a birthday gift from my mom and dad. I had been eying it at H&M for a while and just never purchased it for this reason or another. It’s nice to finally have it in my wardrobe. And I of course was excited when I realized it would go well with my red pants that are so hard to style. This look is so adorably chic! 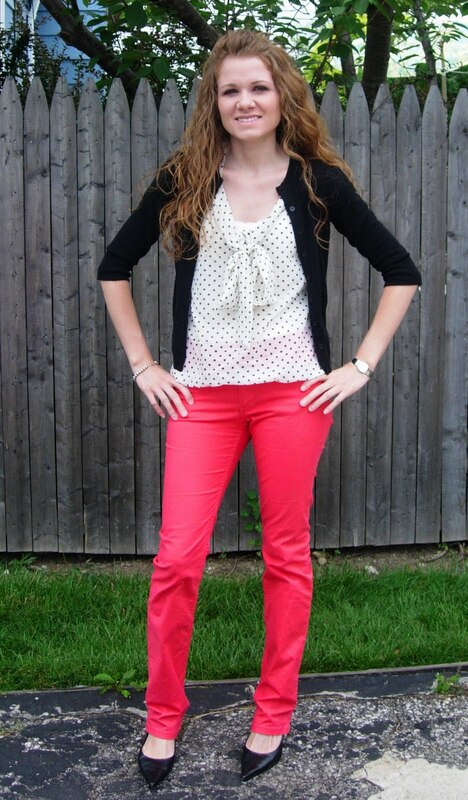 I love the polka dots with the bright pink pants! That pants ROCK! Perfect with the polka dots!